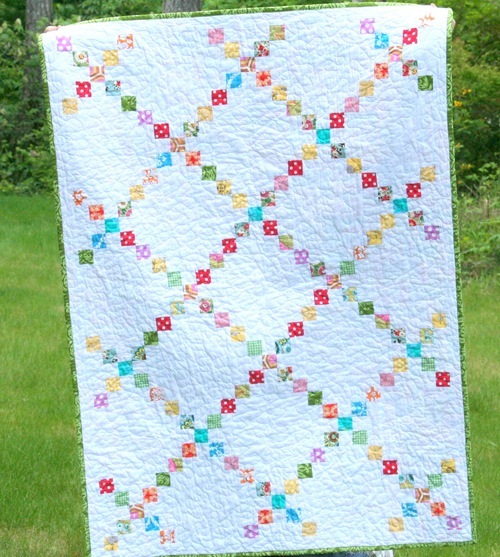 This quilt is based off a traditional chain quilt, but updated to make it more my style (scrappy!) and way easier to make. 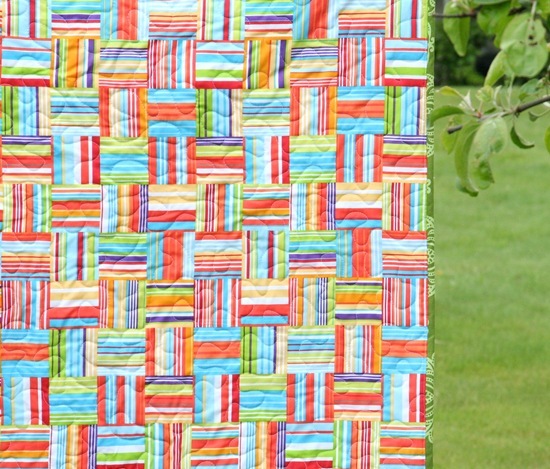 Now I want to make a second quilt with Kona Aqua as the background and all different browns (or oranges….or reds!) for the little squares. This one is a crib size measuring 38 inches by 52. I almost forgot to show you the back…..OH THE BACK!!! I can’t stop looking at it, and it matches the front so perfectly. Did I mention I LOVE this quilt? I do. Update: This pattern is currently not for sale…but will be updated and put back in my shop soon! Awww…it's so summery looking. I love the backing fabric, too! Love it! I just ordered a scrap pack so now I know what I will be making with it. Just bought the pattern as well! I love this! I want to make one right now! So pretty!!! I love updated versions of old patterns… just gorgeous! The back's pretty awesome, and matches perfectly. On the traditional front… More and more I'm starting to realize that the notio of modern quilts isn't as modern as I like to think. Still developing those ideas and hope to post later in the week on it. I know of a lady who sees a "modern" quilt and says, "What the heck?" Different strokes, for different folks. Isn't it a great hobby to have? Something for everyone. Your quilts are lovely to this beholder. Um I really don't know how you do it! You're crazy and amazing all in one ;) Are you still considering coming to quilt market and being part of the Little Londyn family???!!! I could REALLY use the help-plus-we have an extra ticket for the sample swap…LOTS of free stuff!! Think about it! I LOVE it too! I enjoy all the bright fabrics you pick out. I don't always like green but I sure like green binding. Beautiful work! 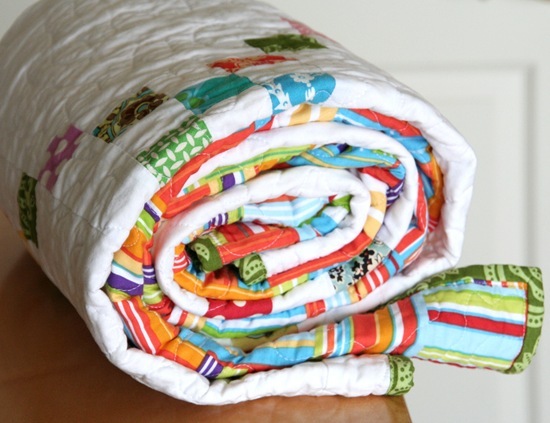 And that backing fabric is fabulous – Cosmo Cricket is one of my favourite designers. This is great – I like the lines of the chain pattern, even if it's usually to traditional for me. This update is really fresh. I love your quilts!! I am taking a beginner quilting class this week. It looks fantastic! Great job! I rarely buy patterns, cause I always think I'll just figure it out myself, but when you mention a secret, easier way…! I just bought this pattern as well as your Chain Reaction, since all your quilts make my insides melt and quiver. Oh – very lovely! Nicely done! I just love it-just bought it-not that I need another pattern, but since someday I want to be just like you, I figured what the heck. Love the back. The front is cute too, but I LOVE the stripes on the back! simply perfect- bringing the old to the new and making it easy too. Can't beat that! that back fits and is mesmerizing. makes my eyes jump around trying to take in all the colors. I love this quilt…but I missed out on the purchase. Will you be able to add more patterns to your shop, that would be wonderful. what a cute quilt! I love the update of the Irish chain quilt. I love this quilt! and I just bought the pattern..very, very nice!! Money well spent! Thanks! Fabulous! Love it! Thanks for inspiring us! I just ordered my pattern, so now I can't wait to play! I love anything with white and this looks like a great way to clean out the scrap box! I tried to find the pattern .pdf file in your store–am I just not seeing it? That quilt is stunning and the back fabric is so gorgeous – I thought you'd pieced the front then gone and pieced the back too. Love this pattern, just bought it last night! Where do you find time for all this with a new baby??? Wonderwoman I guess! 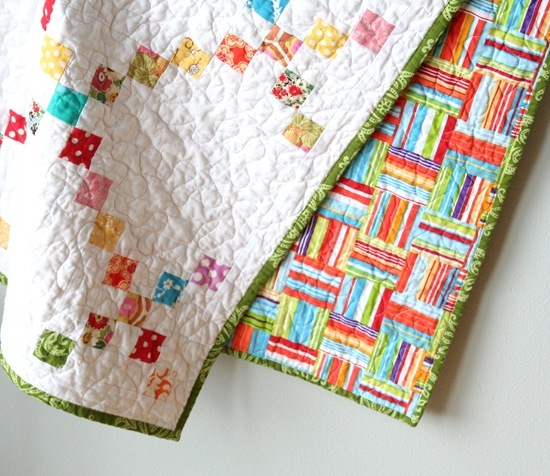 Love your chain quilt and I agree the backing material is out of this world .Just beautiful. oh, and happy mother's day to you!!! Just posted on my blog about my Modern Irish Chain flimsy. I love this pattern! Thanks, Allison!! I too am not a fan of traditional quilts. We went to the fair yesterday and although they had some great quilts, most were traditional using "fall" colors. I love all the modern quilting I see on the web. Great choice of colors to give a modern twist to an old traditional pattern! Love the backing too. Very cute. I would like to purchase this pattern, but am unable to find it on your website. Is it still available? I would be interested in purchasing this pattern too, but can't find the pattern in your store or Etsy. Can you please email me to let me know where to find it? I LOVE Irish chains, but there's no way I have time to make one by piecing like the last. This sounds intriguing! Do you still have this pattern available? It’s popping up on pinterest again.